They say that a picture tells a thousand words, though on this occasion you will simply have to take my word for it! On this particular morning in South Africa we had launched our small ski-boat’ from the beach into what I can only describe as the most horrendous surf conditions. My cameras were secure in their bag, wrapped in a waterproof jacket and hidden away in a secure bow locker well padded amidst a nest of life jackets…and that was where it was going to stay! 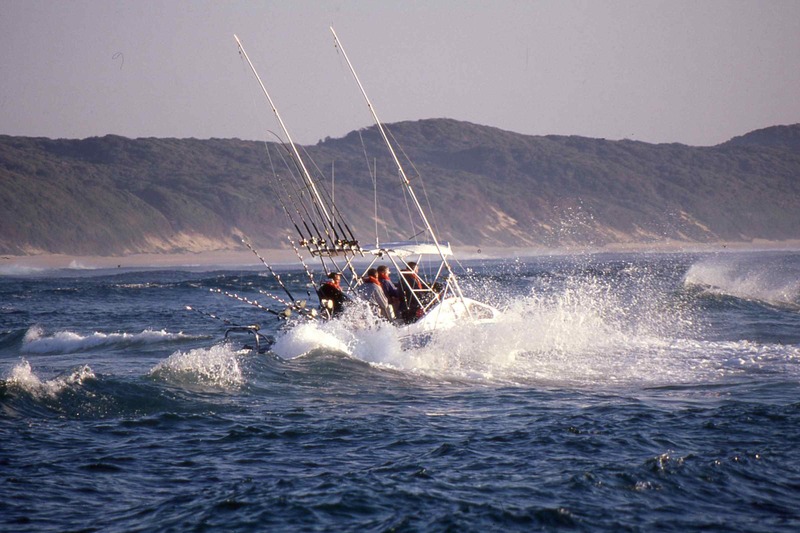 Ski Boat launching at Sodwana Bay, Kwazulu Natal, South Africa, and that’s a calm day! 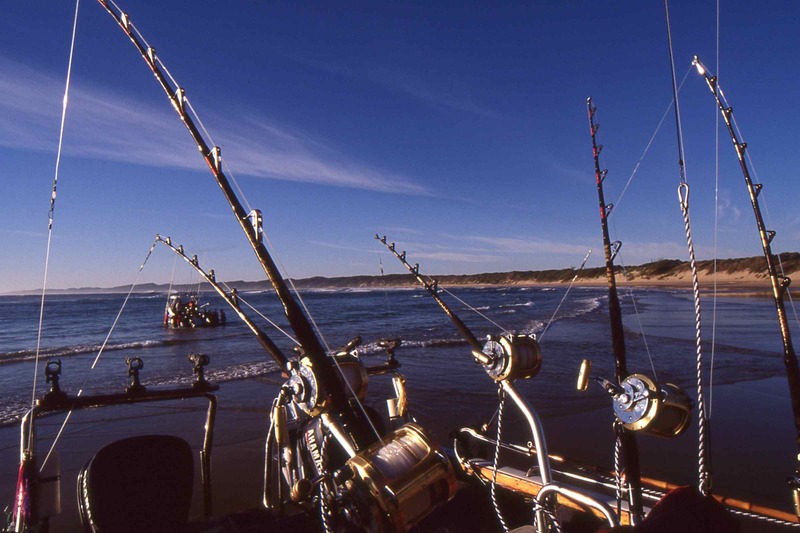 For most South African boat anglers who trail their boats, launching into what we would regard as totally unworkable conditions are something of a fact of life. 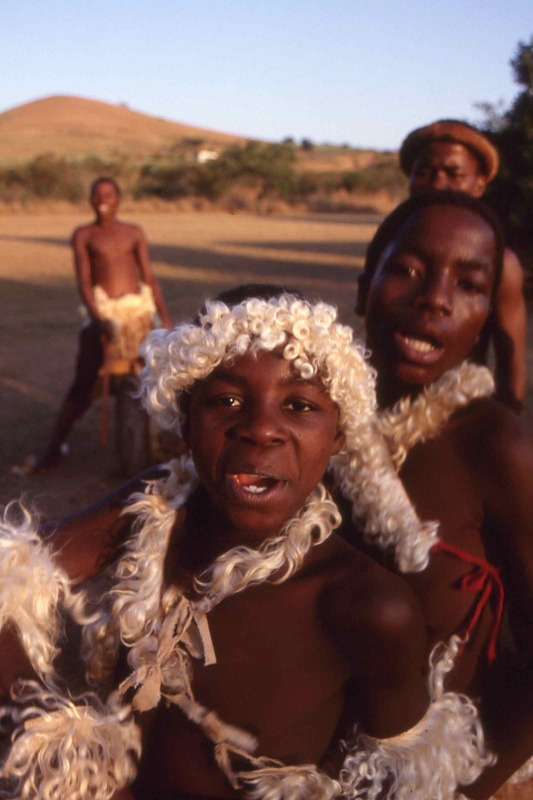 They know that access to some of the finest saltwater game fishing in the world can only be achieved by first running the gauntlet of white water breakers, and after watching these skilled crews at work at dawn on my first morning at Sodwana Bay on the beautiful Kwazulu Natal coastline, they instantly earned my greatest respect. I thought I knew a thing or two about launching trailerable boats from flat and exposed beaches, it is something I have done regularly with my own boats for over 20 years, but watching these guys at work made me feel totally inadequate. Watching them return at the end of the days fishing was like watching an attack party of marines storm a beach! Luckily for my induction to the maelstrom of action that is the trailerable boat scene along South African beaches I was under the protective wing of one Shaun Visagie, who along with his father Martin runs what I can only describe as one of the most exciting big game fishing operations I have heard experienced. 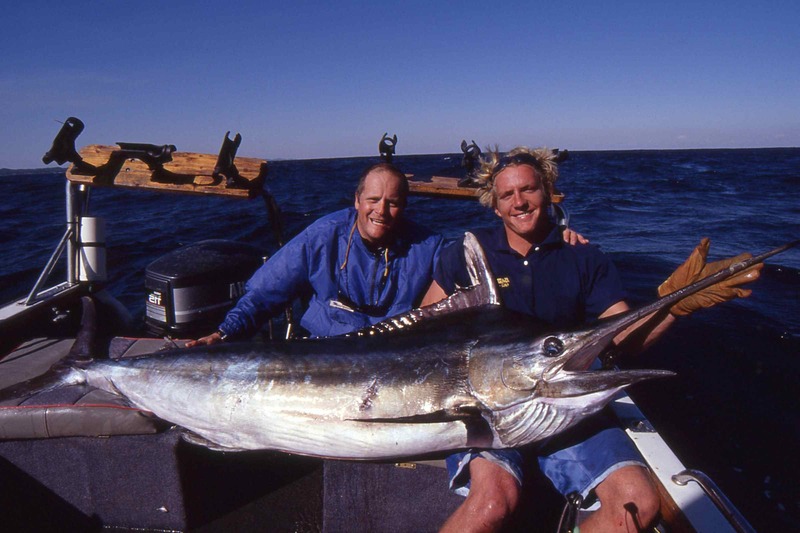 For a couple of years prior to my trip I’d been picking up the odd snippet of information on what was happening along the Kwa Zulu Natal coastline just south of the Mozambique border, and eventually a pattern started to emerge that gave a clear picture of marlin, and often very big marlin, which were getting caught on a regular basis by anglers fishing aboard trailerable boats. 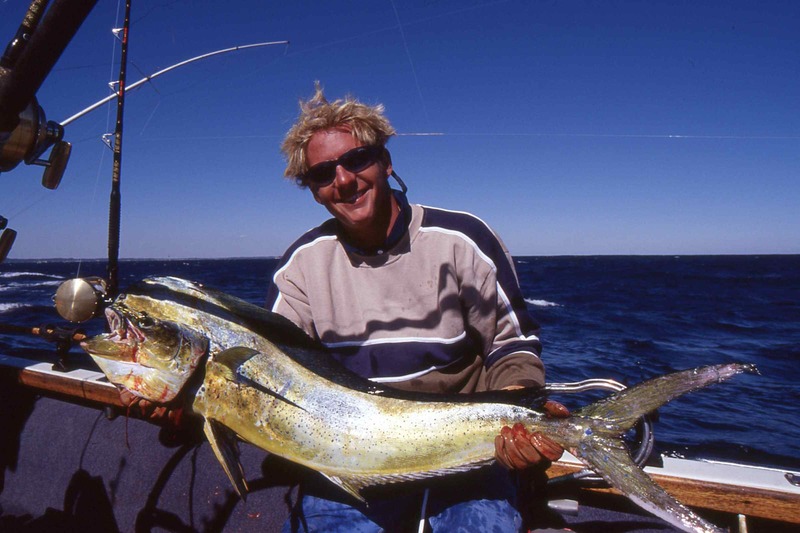 Throw good fishing for giant trevally, enormous great sharks and a cast list of other game fish that includes all of the popular pelagic species, and you will t see how eventually I came to be in this far flung corner of Africa. As it turned out our passage through the surf on that first morning was, pretty uneventful, though I will confess to an occasional twitch or two in the lower part of my stomach as we slowly lurched our way through the breaking waves. Shaun handled the boat like the true professional he is, and in no time at all we were clear of the breakers and heading east. Within ten minutes of clearing the beach we were cruising in some of the bluest blue water I have seen, classic marlin water. We were fishing in 3000ft of water in the Mozambique Current, a tongue of warm tropical water that pushes in a southerly direction between the coasts of Mozambique, South Africa, and Madagascar. Just like the Gulf Stream that feeds the North Atlantic this is an area famous for billfish, and nowhere does it run closer to the shore than off Sodwana Bay. 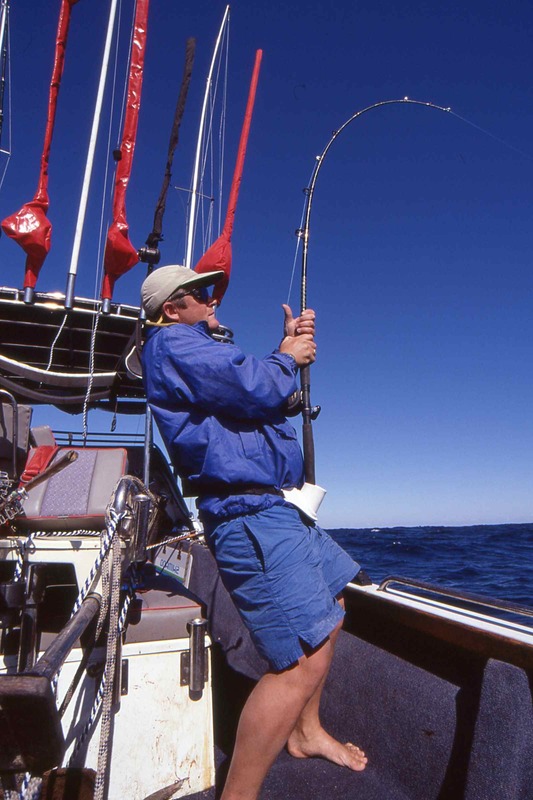 Blue marlin, large numbers of black marlin, a healthy sprinkling of striped marlin, plenty of sailfish, an occasional spearfish and a virtually untapped fishery for broadbill swordfish awaits the angler who fishes at Sodwana Bay. And it’s not just an occasional fish that is caught here, far from it. Martin Visagie told me that the previous year from April to the second week of May his boat caught a 500lb plus blue marlin almost every day he fished, for an annual average of 58 billfish in 58 days fishing for them, including a super grand slam consisting of a two black, a blue and a striped marlin along with a sailfish in one day. On April 1st the year I fished an angler fishing aboard Martin’s boat caught a camp and all-African record blue marlin that weighed 1,110lb. Our plan that first mornings fishing was to concentrate on trolling lures for a big blue marlin, and soon we had four huge lures skipping through our wake, each fished off a 130lb class outfit. The sea conditions were rough and getting rougher, yet the ride aboard ‘Sunbird’, Shaun’s solidly built South African Ski Boat, was surprisingly comfortable. After about an hours trolling a good dorado crashed the lure fishing off the port outrigger, though it offered little resistance as I cranked it in on the heavy tackle. A shame to catch such a sporting fish as that 30lb dorado on such heavy tackle, yes, but we were out there looking for a big fish and we all knew only too well what would have happened had we put a light rod out. By mid-morning conditions had deteriorated to a point beyond the sensible, and reluctantly we decided to head back inshore and concentrate working on the shallower water inside of the deepwater canyons, where conditions would be more favourable. As we worked our way in we spotted a huge flock of feeding birds working above an immense shoal of kawa-kawa or little tunny, one of which was quickly caught and rigged as a live bait on a 30lb class outfit-an ideal bait for a trevally, kingfish, wahoo or any of the other marauding predators that tend to hang around tropical reefs. Sitting in the back of the boat holding the rod, I could feel the little tuna ‘thrumming’ away in the depths, and for the first ten minutes or so I was tense in anticipation of the savage strike I expected to come at any moment. The beach lay less than half a mile away as we slowly drifted around, Shaun occasionally repositioning the boat to keep us working over the prime area of reef. In such places the life expectancy of a tethered tuna is usually measured in seconds rather than minutes. After about twenty minutes I think I had started to nod off, when suddenly I felt the tuna frantically struggling down in the depths. Moments later I felt a dull thud as something picked it up and slowly swam off with it. Any of the toothy ‘razor-gang’ such as king mackerel, wahoo or barracuda I knew would have slashed at it with a sudden violence that epitomises life on a tropical reef but this fish, I thought, was a shark. I allowed slack line to trickle out through the rod rings, and after it had taken about 20 yards I felt the fish stop. In my minds eye I could see the shark turning and then swallowing the tasty little tuna, then seconds later the fish moved off again. With my heart in my mouth I pushed the lever drag forward to the strike position, allowed the line to tighten, then struck hard; once, twice, three times. What happened next will stay fixed in my mind for as long as I live. About 60 yards away from the boat the ocean erupted in an explosion of white water as an ebony and platinum missile went ballistic, grey hounding across the ocean in the first of a serious of ten jumps on course for the equator: a black marlin! The little reel screamed dementedly as the better part of three hundred yards of line were ripped swiftly off the spool, before once again the marlin took to the air in a truly spectacular display of acrobatics. To be honest I think I was in a state of shock, and I can only vaguely remember Shaun gunning Sunbird to follow the marlin as I frantically tried to keep the line tight. It was about 20 minutes into the fight before things started to settle down, and to be honest know one was as surprised as me that I was still actually connected to the fish. I was happy the relatively light tackle I was using would be up to the task in hand in the deep water we were now in, my big concern was that the fish, which we had estimated as weighing 200lb+ was only attached by a wire trace and size 1/0 treble hooks, which would have been more appropriate for zander or pike rather than an angry black marlin! At any moment I was expecting the line to go slack as a hook pulled free, but at this stage there was little more I could than keep the pressure on the fish and regain line as and when I could. An hour into the fight and the fish had towed us back out into the canyons, and it was as much as I could do to stand up let alone fight the fish. At the time I had caught a few blue and striped marlin along with several broadbill and plenty of sailfish, yet always it had been the black marlin that had always eluded me. This was the first I had ever seen, let alone fought, I desperately wanted to bring it to the boat. An hour and a half into the fight and now the fish was down deep, very deep, hanging more or less vertically beneath the boat. With a quiet word Shaun confirmed what I was already suspecting, that is that the fish was totally exhausted and had already died. All I could do was tighten the clutch as much as I dared and try to pull it up to the surface. The trouble with black marlin is unlike other species of billfish, the pectoral fins are permanently locked out, and consequently offer enormous resistance; if only I had been using a more substantial outfit, I thought. Carefully I tweaked the lever drag up beyond strike, wound the tip down and pulled as much as I dared, and nothing happened, everything was rock solid and had we not been drifting in thousands of feet of water I’d have been convinced the fish had somehow fouled the line on the reef. In my mind the fish was now lost yet ironically it was the realisation of this that gave me the determination to pull even harder. In my mind now I was pulling for a break, when suddenly I detected the slightest amount of movement below, and for the first time in ages I managed to gain a few yards of line. Once again I wound down and lifted, and once again I recovered some line. The fish was coming up, perhaps-just perhaps, I might get to see her alongside the boat I thought. Ten minutes later we got our first glimpse of the fish in over an hour, a flash of silver flank still many yards beneath the boat. She was coming up sideways, as we had suspected the long fight on light tackle had been too much for the great fish, she had fought herself to the death. Never would I have killed such a fine fish but that decision had now been taken out of my hands, and as Shaun reached over the side and sunk the gaff into her flank I sank back into the boat, a physical and emotional wreck; and watched in total disbelief as the single point of a badly bent single treble hook fell free from its precarious hook hold in the marlin’s lower beak. 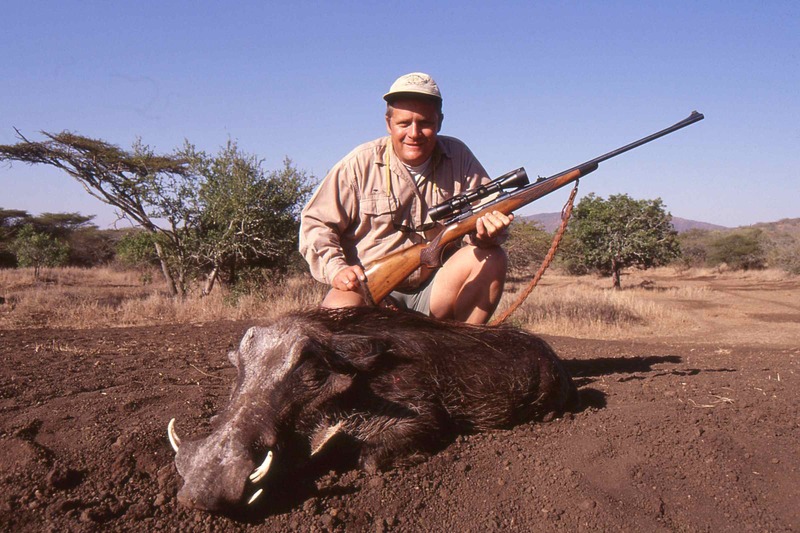 Dad shot Pumba! Day two was cancelled so we went hunting. 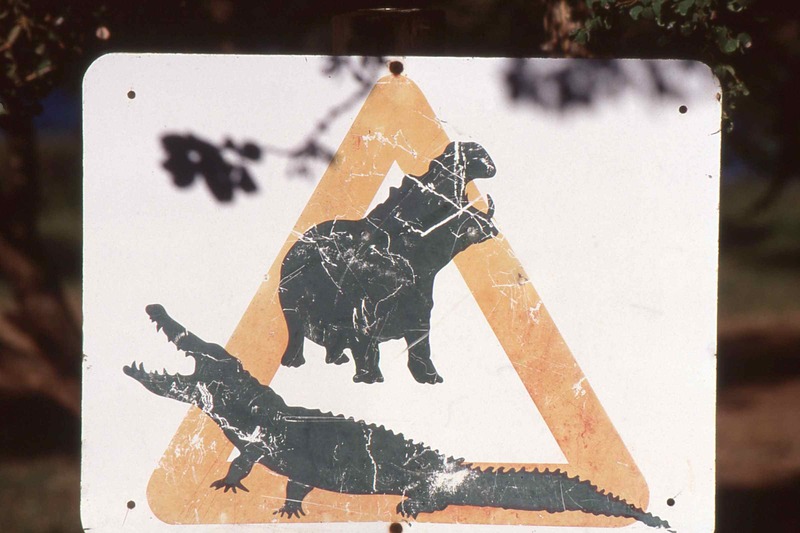 Better be careful; I was!